Wireless division of the largest telecom company in the U.S. The client is involved in financing CPE (Customer Premises Equipment) for its customers, collecting a monthly lease for the equipment. In line with its corporate directive to reduce capital expenditure, the client would like to move away from financing. Instead, it will partner with third-party financing companies (TPFC) to provide financing options for its customers. The client will manage the billing and collection of monthly lease payment from its customers, and will make the payment to TPFC, while retaining a service fee for the transaction. The payment terms in the initial contract will continue to be used for the billing. For a stringent control on spending vs. revenue, the client will not pay the TPFC until it receives payment from its customers on the invoice. The client endeavored to automate the process of contracts and payment collection. 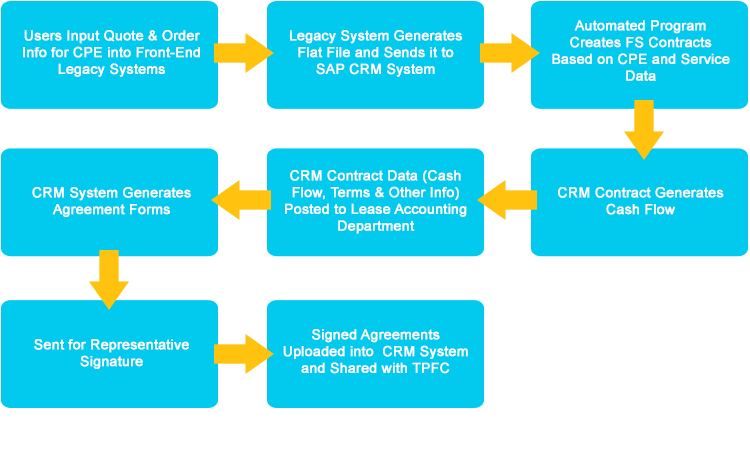 Avant-Garde designed a CPE Leasing Solution, based on SAP CRM to meet the client’s objectives. The solution manages and maintains the Financial Services (FS) contracts for equipments and services financed by the TPFC.